(Nanowerk News) Combining powder diffraction data with electron crystallography can give us a clearer view of modulated structures ("Synergy between transmission electron microscopy and powder diffraction: application to modulated structures"). 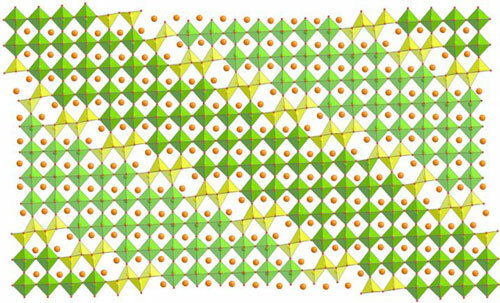 Electron crystallography has begun to be used routinely for solving otherwise intractable structures. When performed in an aberration-corrected microscope and combined with spectroscopic techniques, it can offer unprecedented detail down to sub-angstrom resolution. "The result of all this progress is that electron crystallography gives answers to more and more questions that used to be the domain of X-ray or neutron diffraction, and is especially useful when the X-ray or neutron experiment needs to be performed on a powder material, which limits the diffraction information available," explains Lukas Palatinus of the Czech Academy of Sciences in Prague in a commentary piece in Acta Crystallographica Section B ("Taking a closer look for a broader view: combining powder diffraction with electron crystallography for a better understanding of modulated structures"). This is the refined structure of (Pb,Bi)1-xFe1+xO3-y.